I never heard about Big Sur until recently I saw some advertisement. I do my research and I found an interesting picture about Big Sur. There is a waterfall that flows directly to the sea. Hmmm...it really makes me tempted to go there. So finally the time come last weekend. I manage to bring my friend there. We cruise around CA-1 South using the car. The journey itself is very pleasant, the view is excellent, you are crusing next to the sea. So we make a LOT of stop over to take some picture. So finally we arrived at the Waterfall place 3 hours later. 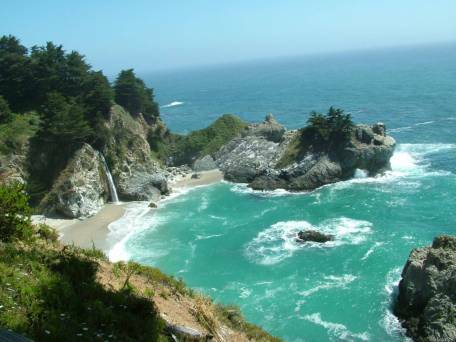 The Julia Pfeiffer Burns State Park is the place of the 1st Waterfall. Pfeiffer Big Sur State park -> Another waterfall here, but...you will need to walk about 3/4 miles. I prefer Julia Pfeiffer Burns State Park though, since its more pleasant, but if you like hiking, you can go to Pfeiffer Big Sur State Park to do hiking while enjoying the scenery. You can see some of the snapshots that we took along the way in the Yahoo Public Gallery. PS: Take note that Yahoo shrink the picture, but if you like it, you can always print it out :P, the printing itself should be good since you can use the higher resolution version.